Please click the image above to read my interview with Rocky composer Bill Conti for Red Bull. The Oscar winner discusses what it takes to create a classic movie theme. Please click the link above to listen to my BBC Oxford reviews, broadcast on 19th May. Reviewing the films “X-Men Apocalypse” and “A Hologram For The King”, we also discuss Daniel Craig’s future as James Bond. Please click the image above for my appearance on Nick Ferrari at Breakfast, broadcast on LBC Radio on 10th November. I called in to discuss the performance of Bond film “SPECTRE” at the US Box Office. David Prever Drivetime Show, Home Entertainment Review, 20th July: reviewing the DVD release of “Home” plus “A Walk Among The TombStones” and “Despicable Me 2” on streaming. David Prever Drivetime Show, Bond Special, 22nd July: Talking about the latest trailer for “Spectre”. David Prever Drivetime Show, Cinema Review, 23rd July: Reviewing “Inside Out” and “Southpaw”, plus looking at events in Oxford and the UK Box Office. Click the link above to listen to James Cannon’s Drivetime show for BBC Radio Oxford on 26th October, which is available to play back on BBC iPlayer until 02/11/2012. I come in at around the 1 hour 20 min mark for the “Films On Friday” segment, and discuss the UK box office along with the week’s big release, James Bond film “Skyfall”. 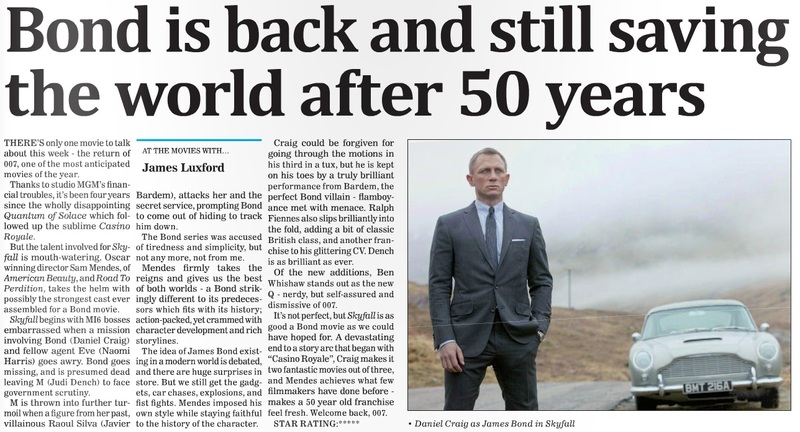 My review of the James Bond film “Skyfall” for Oxfordshire Guardian and it’s sister paper Basingtoke Observer. Please click on the image to read a larger version of the article, or click here to read it in the Guardian’s ‘e-paper’. Posted in Basingstoke Observer, Movie Review, Oxfordshire Guardian | Comments Off on Oxfordshire Guardian: “Skyfall” review.